Why live an unforgettable experience with us? All in one! 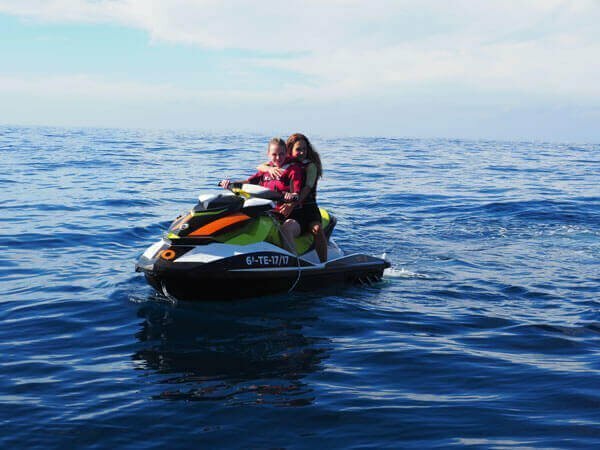 In West Tenerife we recommend you to live a unique experience with our West Tenerife tour, where you will enjoy a route in Zodiac, a Jet Ski ride or a peacefull ride in our exclusive boat Pontón. For the more daring ones, we’ll make a stop in the middle of the ocean where you can take a dip to snorkel with the most powerful torpedoes on the market. If you are calmer, you can paddle surf or stay on board, enjoying a fresh fruit snack courtesy of West Tenerife. Do you want to be picked up to the port? We’ll take care of it for free! We make a route through the main areas of the south of the island picking up our customers to start the adventure from our West bus. If you prefer to drive your own vehicle, we have reserved a space for our premium customers where you can park at no extra cost while enjoying the experience. 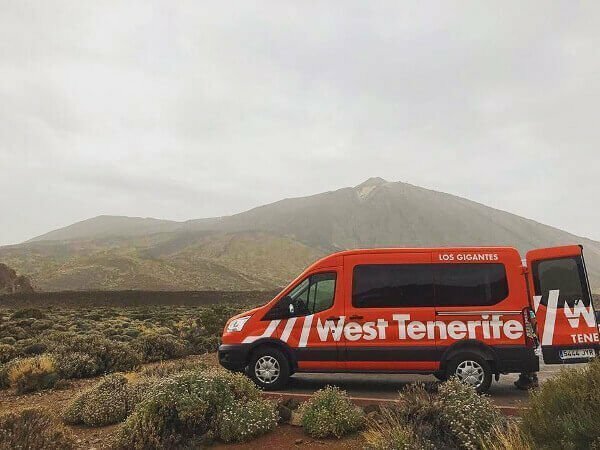 In West Tenerife we guarantee the safety of our customers in all activities that comprise the West Tenerife experience, as we have a civil liability insurance for each of our customers. Do you feel like living the experience? 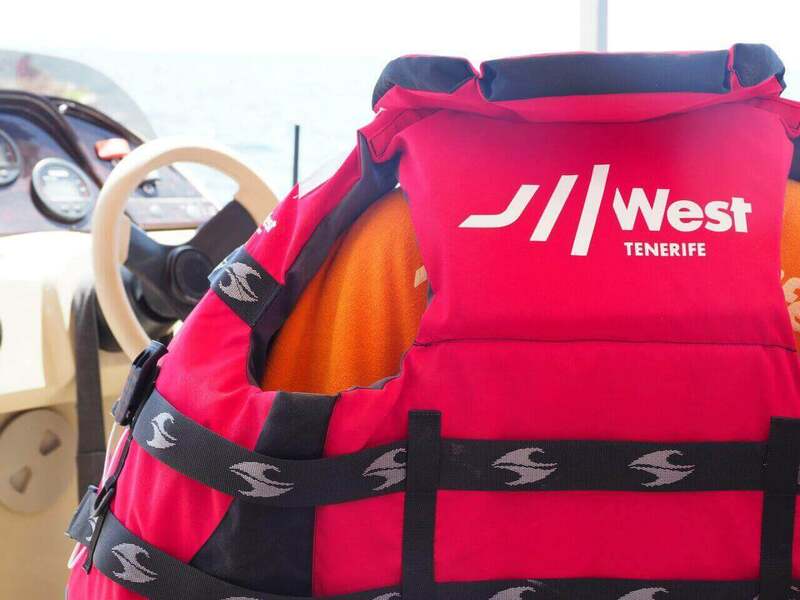 In a mandatory manner, all our clients must wear the lifejacket from the moment they leave the port, in each of the activities carried out and until they reach the point of origin, to ensure their safety. We provide you with a locker at the exit point so that you can store all your belongings and just have to worry about enjoying the experience.. In addition, we have towels at your disposal so that you can take shelter once the activities are over and get back on the boat to return to the port. Although it is not intended to be in permanent contact with water, neoprene suits are part of the uniform of our customers in order to protect them during the activities. 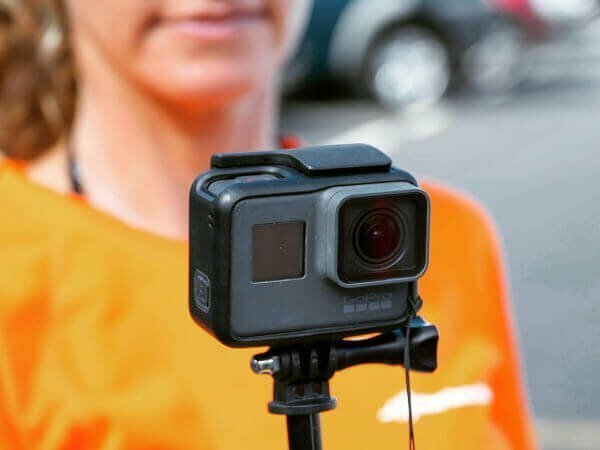 Was we want you to have a good memory of your experience, we lend you a Go Pro HERO 5 camera so you can take pictures and videos from your own perspective. At the end of the tour, you decide which photos to take to share with your friends and family. 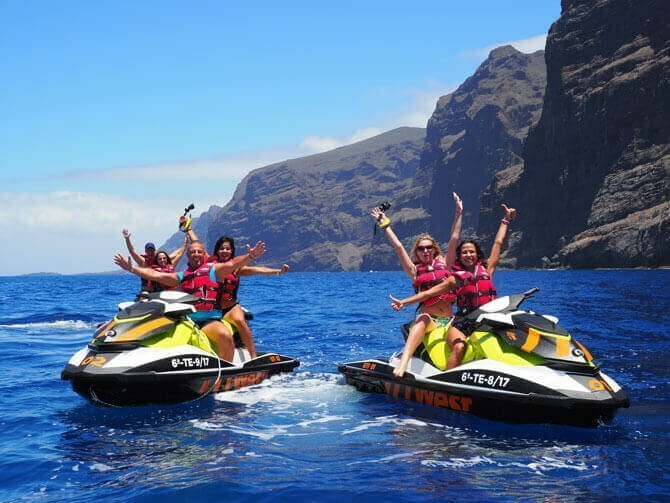 Feel the adrenaline and sail the Atlantic waters riding one of our latest generation Jet Ski and explore the cliffs of Los Gigantes, an incredible natural enviorment. 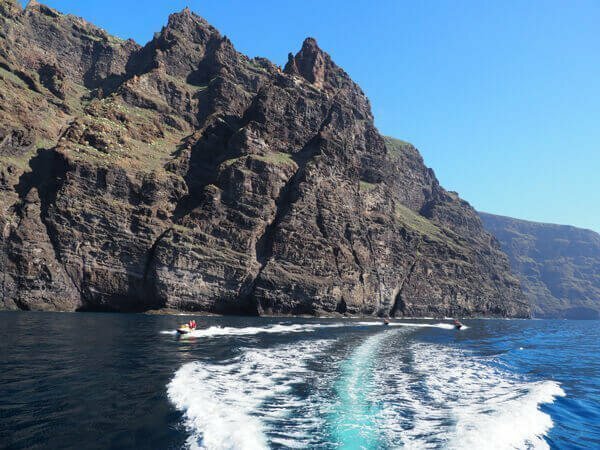 Live a unique experience on the west coast of the island, discover the secrets of this landscape in the only route that connects Los Gigantes with Punta de Teno, suitable for the whole family. The reservations on internet are accepted from 24h before the excursion. If you would like to make a reservation before more than 24h, you can call us at +34922860044 or WhatsApp at +34659374426. 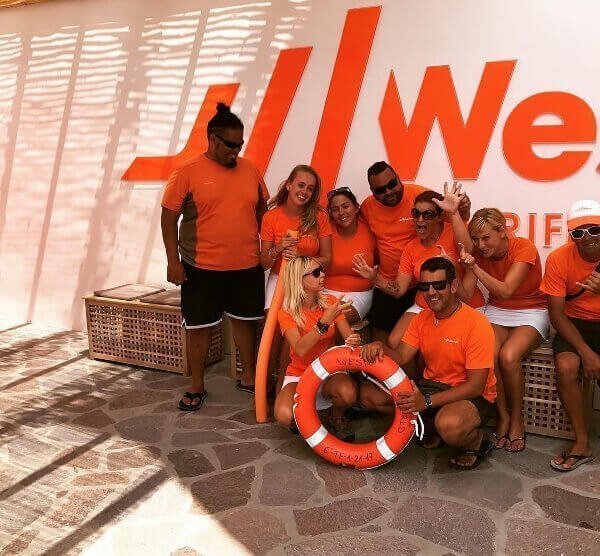 As well you can send an email to info@westtenerife.com. The duration of the excursion, as well duration of parts of the excursion are approximate. Depending by the circumstances, changes and modifications can be made. The final excursion time will be confirmed before 72 hours by email. If you do not agree with the date and time given, earlier than the last 24h before the excursion, reservacion might be canceled and changed to another date by email without any fee. You can cancel the reservation up to 24h before the excursion with a penalty fee of 25% of total amount. It is not posible to cancel the excursion in the last 24h before the excursion, in this case 100% of money will be lost. You should be at the harbour one hour before the excursion because our team have to explain all the security rules and regulations. In case of not arriving to the office 1h before the excursion, the reservation is canceled without a refund. At the end of the tour you will be able to acquire the photographs of the adventure on our office by purchasing them. Younger children than 8 years old cannot participate in the activities. (Under 7 years old with a minimum height of 1.35 m. can participate in the activities). Youngsters from 8 to 18 years can go as companions of the adult or legal tutor that drives the Jet Ski all the way. Youth between 16 and 18 years old may drive the Jet Ski with an autorization of parents or legal tutors. The groups of the same excursion are up to 8 persons (4 Jet Skis). When the reservations are made for 8 persons, the departure hour is more guaranteed.